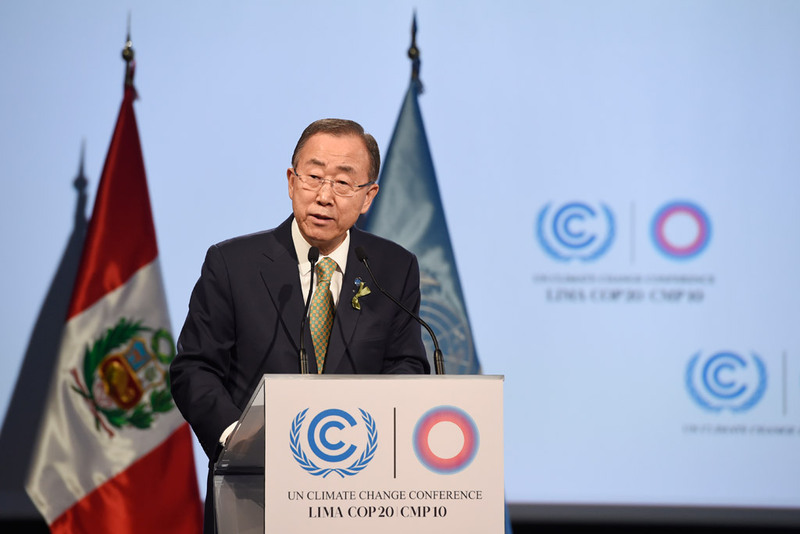 14 Decem­ber 2014 – Sec­re­tary-Gen­er­al Ban Ki-moon has hailed the out­come of a Unit­ed Nations-backed cli­mate con­fer­ence recent­ly con­clud­ed in Lima, Peru, prais­ing del­e­gates for set­ting the ground­work for a more con­clu­sive agree­ment to be reached in 2015, a spokesper­son for the Orga­ni­za­tion today announced. The UN Cli­mate Change Con­fer­ence (UNFCCC), known also as Con­fer­ence of the Par­ties (COP 20), con­clud­ed its 12-day meet­ing last Fri­day hav­ing brought togeth­er the 196 Par­ties to the UNFCCC in an attempt to ham­mer out a new uni­ver­sal treaty which would enter force by 2020. The final agree­ment is expect­ed to be hashed out in Paris at the end of next year. IND­Cs are the com­mit­ments coun­tries are expect­ed to make in order to keep aver­age glob­al tem­per­a­ture rise below 2ºC – the inter­na­tion­al­ly-agreed lim­it aimed at staving off irre­versible cli­mate change. Also in Lima, acknowl­edged the state­ment, the $10 bil­lion goal for the ini­tial cap­i­tal­i­sa­tion of the Green Cli­mate Fund – the ini­tia­tive designed to direct fund­ing from devel­oped nations to those devel­op­ing coun­tries most vul­ner­a­ble to cli­mate change – was sur­passed. Dur­ing the final hours of the Con­fer­ence, nego­ti­a­tions report­ed­ly “stum­bled” over dif­fi­cult issues, such as how to dif­fer­en­ti­ate the oblig­a­tions and respon­si­bil­i­ties of devel­op­ing and devel­oped coun­tries, with frus­tra­tion grow­ing among many of the atten­dees. “With this COP and mov­ing on to Paris, we cement the fact that we will address cli­mate change,” she not­ed. Freedom Advocates, publisher of Agenda 21 News, has decided to cease further publication of Agenda 21 News posts. This discontinuation of the Agenda 21 News Digest takes effect immediately. Agenda21News.com will remain live for at least a month, so that those who would like to review or download articles can do so. We would like to acknowledge the fine work performed by Katherine Lehman in editing the publication for the last year. Also available to you are infrequent emails from Freedom Advocates. If you are not currently receiving them, you can sign up for them at www.FreedomAdvocates.org. These sources are helpful in keeping you informed regarding the Globalist / Agenda 21 movement. Thank you for your interest in Agenda 21 News. Sustainable Development is the blueprint being used across America and around the world to implement the United Nations Agenda 21 Programme. To help keep you up-to-date on the transformation, Agenda21News delivers relevant news and information. You will see concrete examples and explanations of Sustainable Development and its many faces - Smart Growth, Regionalism, Charter Schools, Common Core, ICLEI, the Wildlands Network, Public-Private Partnerships, and much more. In summary, Sustainable Development seeks (1) the abolition of private property; (2) "global citizenship” with allegiance to a tyrannical system; (3) complete top down control utilizing technology (technocracy) and neighborhood snitches; and (4) to create discordance within the human population. Share the articles, spread the word and make a difference!